Indian meal moth adults have a 5/8″ to ¾” wing span. The wings are a copper brownish color with a grey band near where the wings attach to the body. The larvae are about ½” long and dirty white in color. The head is a reddish-brown color. All infested items must be discarded and all uninfected products should be placed in insect-proof containers. Shelves and cupboards should be thoroughly vacuumed and treated with a residual pesticide. Pheromone traps can used to help locate areas of activity. 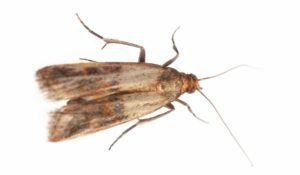 Adult, case making clothes moths are approximately 3/8 to ½ inch from wing tip to wing tip. The wings and body are buff to golden with a brown tinge, and the front wings have three dark spots. However, these distinguishing characteristics are often rubbed off. The larvae are small caterpillars, 3/8 inch long in size, that live within a small portable, silken case. 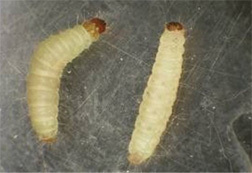 The larvae have dark head capsules and the first thoracic segment is dark brown or black. Female clothes moths begin laying eggs (37-48) singly on suitable larval food the day after emerging as an adult. The larva feed for about 33-90 days and moults 5-11 times. The clothes moths prefer products of animal origin, secondarily feeding on products of plant origin. It is a pest of woollens, rugs, feathers, felts, skins, drugs, furs, and stored tobacco. 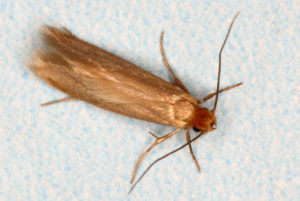 Case making clothes moths shun light, and although the males are active fliers, the females fly only short distances. The key to controlling this pest is through thorough inspection and identification of infested materials. Infested rugs, carpets, and furniture should be cleaned thoroughly and protected with a residual insecticide application. Larvae are easily removed from infested clothing by cleaning or laundering.